You know you want to frequently post those amazing images of food and the restaurant to various social networks to stay on top of your customer’s minds and engage with them. But you have a restaurant to operate and have very limited time to manage posting photos to multiple social networks. What you need is a quick and simple way to take pictures and post it instantly to various social networks. Having to download photos from a camera to a computer, processing the pictures on an image processing software and uploading to social networks is time-consuming and generally not feasible for the busy restaurateur. To cross-post on the various social networks, it needs to be done from a smartphone. Today most smartphones have excellent cameras that rival the quality of professional cameras and additionally come with image processing apps that make photo editing a cinch. To get started, all you need is a iOS or Android smartphone with available memory space for pictures. You only have to set up the apps once for your restaurant. Create profile names on each of the social networks for the restaurant. Choose the social profile names (handles) that is close to the actual restaurant name, depending on the availability on the netowrk. If the restaurant name is Pete’s Pizza located in Chicago, try to get the handle petespizza or petespizzachicago on each of the social platforms. You will use the Instagram as the primary app to post your restaurant photos and then the app automatically posts to facebook and twitter. Click on People icon (bottom right). Click on Options gear icon (top right). Switch to Business account (if you are logged in as your personal account). Link up your Restaurant’s Instagram account. Link Facebook, Twitter and other social networks. Take a picture of food or restaurant. Create a post within Instagram app by selecting the picture and applying any filters. Select facebook and twitter button. We have shown you an effective tactic to cross-post to the various social network as quickly as possible for a busy restaurateur. 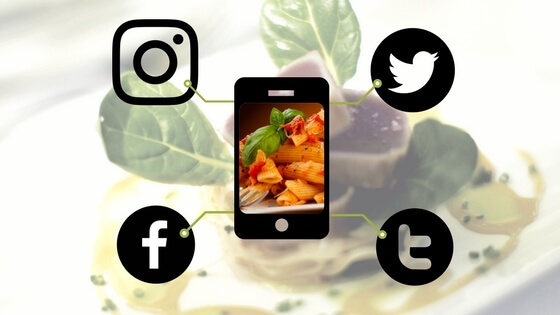 However, it is important to understand that you need a complete social media strategy for your restaurant to effectively engage with your customers and attract new diners to your restaurant. Need help with your social media strategy? Contact us for a consultation. How is your current social media strategy working for your restaurant? Tell us what you think works best in the comments section below.